Walk up to this bar, and there are a couple things that suggest something special is going on. One is the sign, which reads 'Casa Mariol' in typography that is at once vintage and fully modern. Peek closer and you see a pile of barrels, functional and outfitted with taps, lining the wall upon entering. Hopefully, at this point, your curiosity is peaked and you have entered one of Barcelona's finest vermouth bars, Casa Mariol. Barcelona is a mecca for vermouth lovers, as I have already gone about over here. Many bars claim 'vermut casero,' or housemade vermouth, but in most cases this means a vermouth made by some bodega that has been doctored up a bit by the bartender. In Casa Mariol's case, however, it's true. 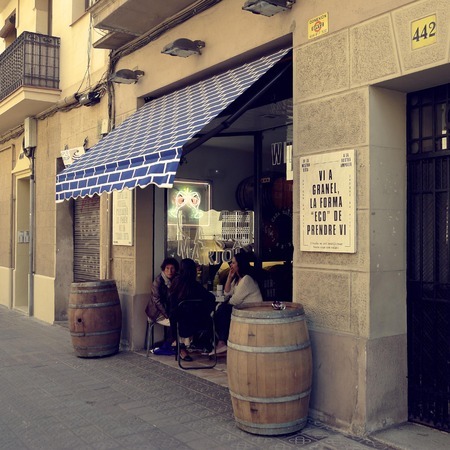 This is the retail outpost of what many opine to be on of Spain's tastiest artisan vermouths. Casa Mariol's vermut negre is outstanding not only for its black, medicinal looking bottle. The vermouth is less syrupy than the industry's big boys, and hits you strong with cinnamon and thyme, a combination that is not exactly typical in vermouth world. It's. so. good. 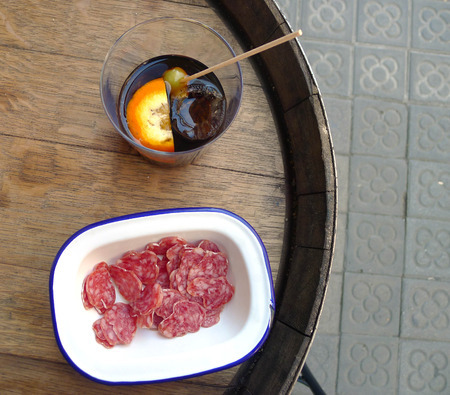 People show up for la hora del vermut, to sip on some vermouth and have a few snacks. 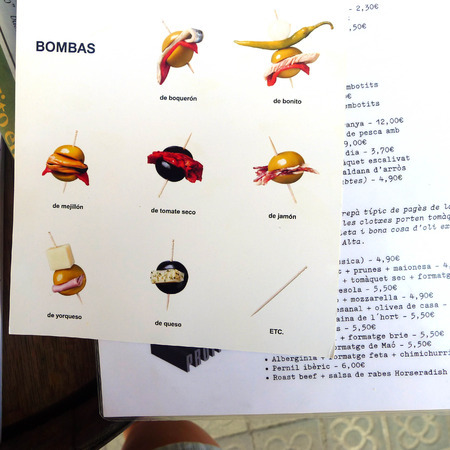 A big section of Mariol's menu is made up of bombas, lagartos, and cohetes from Vallekas. These designer snacks carry on the über-tradition of banderillas, the general name for a lot of vinegary things stuck on a stick in Spain. They also march in and out with plastic liter bottles, filling them with bulk wine and vermouth like you would with water bottles from your kitchen tap. My professional advice is to go, settle in for a couple marianitos, and pick a few of the snacks off of their very Catalán menu. They have everything that was ever meant to be eaten alongside vermouth, with a distinct local flavor, from fuet, to escalivada, and pa amb tomaquet to conserved shellfish. One of the great things about Mariol is that it is right near the tourist attraction of Barcelona, the Sagrada Familia. So when you find yourself a couple blocks away on your next visit, make a stop that will take you worlds away, from the bustling crowds in front of the SF to the quiet backstreets of Barcelona, with a chilled vermouth in hand.